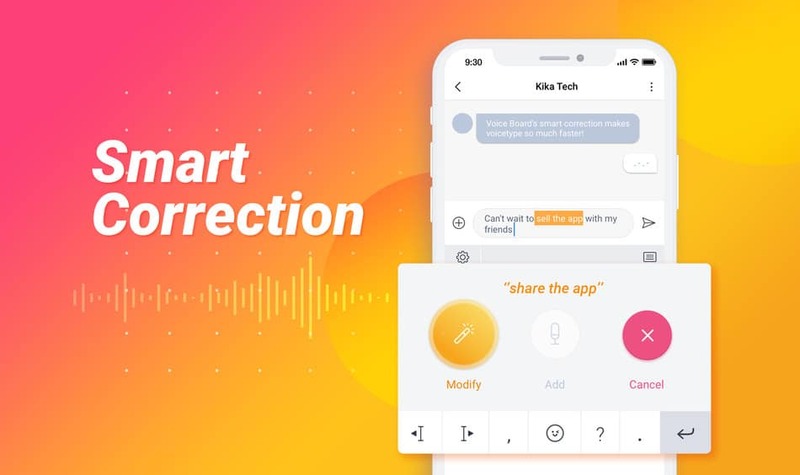 Kika Tech has created an AI-powered voice add-on for Kika Keyboard, called Voice Board. The new addition is completely integrated with Kika Keyboard by default, and does not have to be downloaded or enabled. Powered by deep learning technology, Voice Board is able to transcribe things that users say in just about any circumstance with help from its deep learning core, features the full range of characters and emoji just like on a regular keyboard, and has a smart correction feature that uses natural language processing and voice recognition to figure out what part of a dictation a user wants to correct or replace. Voice Board is opened by going into any text field with Kika Keyboard set as the currently active keyboard, then tapping on the microphone icon in the top right of the keyboard. You tap the centered Add button to speak, and Kika detects when you've stopped and are ready to cap off what you're saying. Punctuation, for the most part, still has to be done manually, so along the bottom, you'll find left and right cursor keys, a comma, a period and a question mark. There's also a Go button down there that functions as an enter key, and an emoji button. You can use that button, or simply say what emoji you want. The keyboard's smart correction feature allows you to simply hit the Replace button, then say the word or phrase you want to correct. From there, Voice Board will figure out what you wanted to fix, and will try to reinterpret your voice input while making sure not to reuse the original interpretation verbatim. This new feature draws on Kika Tech's vast and constantly building AI expertise, as well as an ever-growing database of words and phrases and data on how they interact with the rest of a sentence or paragraph. Kika Tech claims that Voice Board is the most accurate voice typing app on Android, and whether that's true or not, its unique feature set makes it worth a try for anybody looking to use voice typing on more than a novelty basis.